Andy H: Well, July has been a long month in the comic world. It's five weeks instead of four so things have been spread out a little. It certainly shows that on my pull-list this Wednesday as it's quite a quiet one. So I'll start with comic that's not a comic. Fables comes to the end of it's 13-year run. 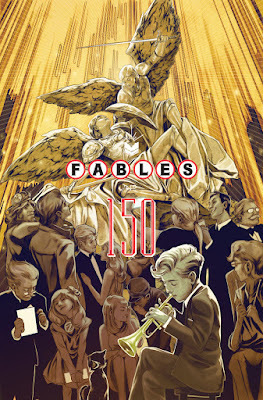 Issue #150 isn't really an issue it's a graphic novel (Volume 22) and that's a fitting end to such a beloved title. Bill Willingham finishes what he started joined by regular artist Mark Buckingham for the main story and various artists for back up stories. From Image this week we have Birthright #9. A fantastic run from Joshua Williamson with perfect art from Andrei Bressan. We know the secret that Mikey is hiding from his family and we know it's only a matter of time before they find out. The suspense is being handled well and keeps me coming back for more. From the world of Secret Wars there are three I'll be picking up. Future Imperfect #3 by Peter David and Greg Land, Old Man Logan #3 and Marvel Zombies #2. Marvel Zombies features a version of Elsa Bloodstone close to the the Nextwave version, which is a win for me. Rounding off this weeks comics is the finale of Alex de Campi's Archie Vs. Predator. It's a guilty pleasure and it's been a fun ride. Will the Predator survive the combined might of Betty and Veronica?! I'll finish as I started, on a graphic novel. It's time for the last collected edition of Zenith. My long wait will be over and the completed Zenith run will have pride of place on my bookshelf! Life is good. Tom P: We'll start on a sad note this week as C.O.W.L wraps things up with its final issue. It's a real shame as I discovered it via the first trade and quickly snatched up every single issue since. I just hope it all comes to a satisfying conclusion but, even if it doesn't, I've thoroughly enjoyed the ride. The only other thing out this week of interest to me is Old Man Logan #3. I'm having a blast reading this and its reminded me how much I've missed reading a Wolverine title and that the selection of Secret Wars minis I've decided to read continue to impress. So team all that up with last week's All-New Hawkeye #22 and Archie #1 that I've still to pick up from Andy H at Paradox and I'd say that's some good reading!